The sun-orbiting SOHO spacecraft captured this image of filaments erupting off the sun's surface and magnetic plasma blasting into space. The field of view of this image, seen in ultraviolet light, extends some 1.243 million miles from the solar surface. The huge solar storm that NASA detected hurtling toward Earth hit our planet at 5:42 a.m. EST Thursday. So far, there have been no reports of major power or communications disruptions. The storm's magnetic fields are oriented in a way that's "been opposite of what is needed to cause the strongest storming," says the Space Weather Prediction Center. So, the main effect of this storm, which the AP calls the largest in five years, may only be to paint colorful auroras across the night skies above Iowa, New York and Illinois. But it's not the last you'll hear about "Solar Flares Speeding Toward Earth," as we told you yesterday. 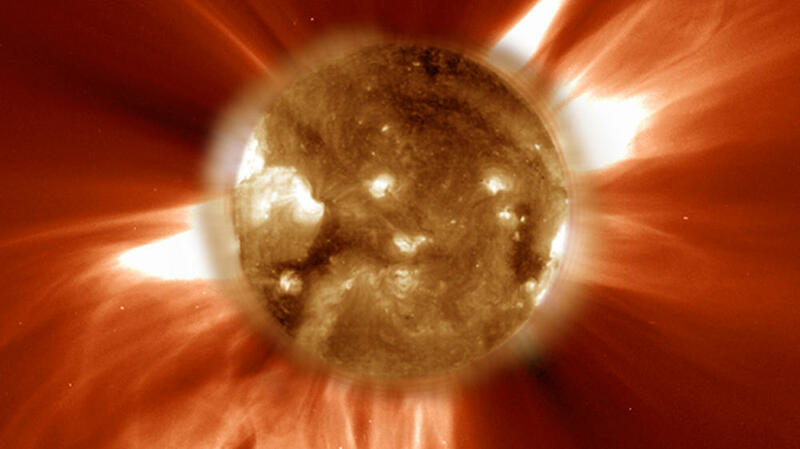 The sun is currently in a very active phase, and it won't peak until 2013, according to NASA. This week's large solar flares, and a similar episode in late January, have sparked a lot of curiosity about the phenomena — and led some to worry about how they might disrupt life on Earth. "Powerful magnetic fields arc upwards from the surface, rising high into the solar atmosphere to form giant, twisting arcades of energy. Matter streams up these arches to be gripped in a magnetic vise a million miles above the surface. Then something happens. Something shifts. Magnetic lines of force in the arcade snap like steel cables on the bridge to heaven. Billions of tons of solar gas are suddenly blown outward, exploding across interplanetary space. Three days later the shimmering ball of energy smashes head-on into the unsuspecting Earth." But Adam is quick to clarify that we earthlings are not, in fact, unsuspecting — we're very aware of what the sun's up to. And to him, the fact that we study solar activity the way our ancestors might have noted the oceans' shifting tides means that we've arrived in a new era. "Now we have become a high-tech, space-faring race encircling the planet's surface with power lines and its skies with orbiting satellites," he wrote. And there lies the rub. Thanks to advances in science and technology, we're very good at detecting the ebbs and flows of the sun's 11-year activity cycle. But much of our communications and energy technology can also be devastated by the effects of a massive solar storm. The worst-case scenario of a huge solar storm leaving "millions of people around the world without electricity, running water or phone service" isn't a matter of sci-fi conjecture — it's a precise possibility raised by U.S. space and emergency officials, as Jon Hamilton reported in 2010. In the government exercise, officials from the U.S. Space Weather Prediction Center and the Federal Emergency Management Agency looked at how our systems might respond to a solar storm of a magnitude like those that struck the Earth in 1921 and 1859 — events that, as Jon reported, "can release as much energy as 1 billion hydrogen bombs." To clarify, those are the possibilities if we experience a category-5 solar storm. For comparison purposes, this week's solar storm has been estimated to have a rating above 1 (minor) and spiking into 3 (strong). But NOAA uses a different measure to rate possible effects here on Earth — the geomagnetic scale, on which this week's event rates just a 1. You can see a guide to the rating scale at the National Oceanographic and Atmospheric Administration's site. Even a small storm can cause trouble. For instance, in 1989, Canada's Hydro-Quebec power grid went off-line for more than nine hours, a disruption that was estimated to cost hundreds of millions of dollars in repairs and lost revenue. "There are other winds and other storms we must now be attentive to as we go about our business. In this way, as in so many others, our long childhood as a species has ended for better or for worse."